Home — News — Such exciting news to share! Such exciting news to share! First, I want to share my BRAND NEW improved website at Phyllis Harris Designs! This was a HUGE labor of love and I am SO relieved it is finally done! I hope you will notice it has a much cleaner look and the visitors will hopefully enjoy a wonderfully easy to navigate experience as they visit my shop. I could not have done it without the wonderful help from http://aeolidia.com. I highly recommend them to anyone looking to create a website/ecommerce website. Something else new for my friends to enjoy is $6 Flat rate domestic shipping and FREE domestic shipping on orders over $100! No special code needed. 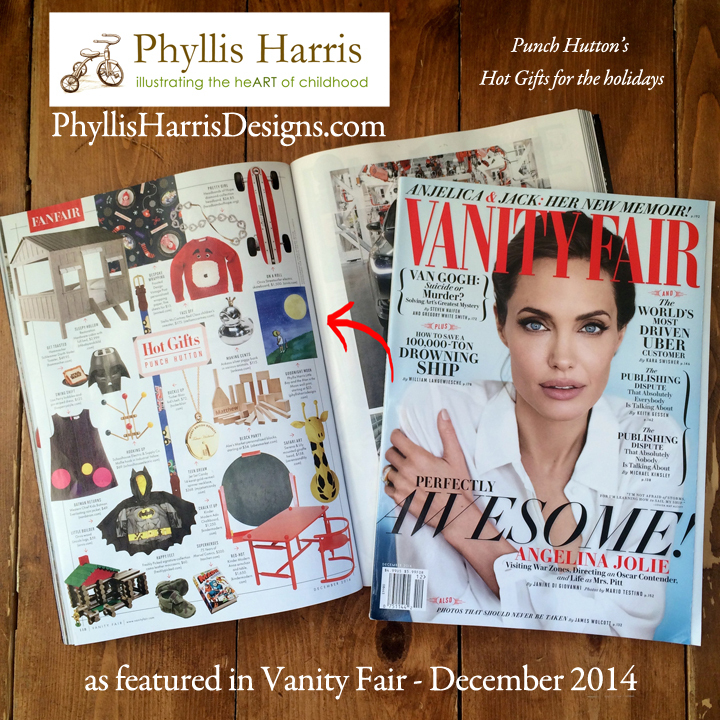 And next in the news....drumroll..... We are SO EXCITED to share that Phyllis Harris Designs was featured on the pages of Vanity Fair magazine in their 2014 December issue on the news stands right now! We were featured on the kid's gift ideas page titled Punch Hutton's Hot Gifts. If you get a copy be sure to look on page 118. Such a blessing and SO exciting that I just had to share with all of you!!!! Mark your calendars! I want to give you all a head's up on the future sales coming up on Black Friday all day November 28, 2014 and Cyber Monday, all day December 1, 2014. All day Black Friday enjoy 25% off everything in my shop by using code BLACK25 and on for Cyber Monday the code is CYBER25 at checkout.